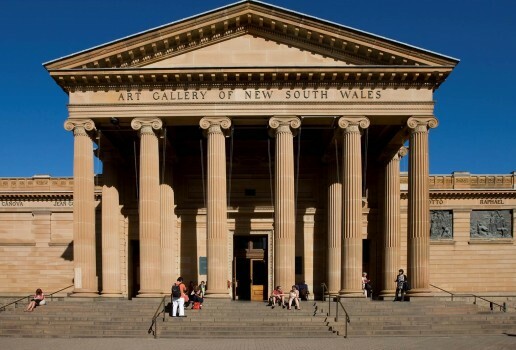 Established in 1871, the Art Gallery of New South Wales (Art Gallery of NSW) is the leading museum of art in New South Wales and one of Australia’s foremost cultural institutions. It presents nearly 40 exhibitions annually, drawing on significant collections of Australian, European and Asian art. The Art Gallery of NSW has been a partner of the Biennale of Sydney since 1976. The Art Gallery of NSW is located on the eastern side of Sydney’s CBD, next to the Royal Botanic Garden Sydney and The Domain, a short walk from St Mary’s Cathedral. The Gallery is easily accessible from St James and Martin Place stations, bus route 441, and Sydney Explorer bus stop 12. A permanent access ramp is available for entry to the Art Gallery of NSW, as well as ramps and lifts within the Gallery for access to exhibitions, and to the shop, café and restaurant. For a floor plan and further access details, please see the Gallery’s website.